This member of the Amaryllidaceae was described by Frans Verdoorn in 1953. 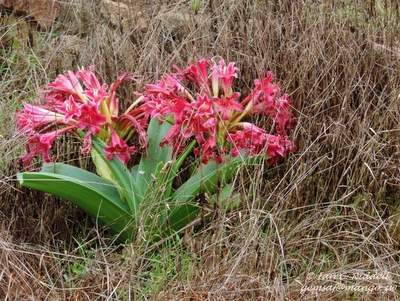 It is found in the Southern Africa, growing in sand or other well drained soil with some water and lots of sun. The bulb will slowly grow to ten centimetres in diameter, the 80 centimetres long leaves will form a 40 centimetres high plant. The flowers are from almost white over striped to dark pink. It can only be reproduced by seeds.